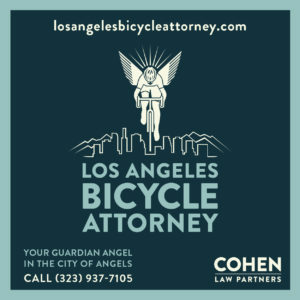 I’ll be meeting with the officers in the LAPD’s bike liaison program later today; leave a comment below if you know of any bicycling issues or problem areas you’d like me to address with them. Peter Flax, former editor in chief of Bicycling magazine, connects all the dots in the Nick Brandt-Sorenson doping scandal. He points out that the rider disqualified for doping after winning the Masters 30-34 national road championships — and recently convicted of selling performance enhancing drugs over state lines — is the same one who owns many of the allegedly dope-aided LA-area KOMs on Strava. Many people, especially road-racing types in Los Angeles who have to wake up to emails from Strava notifying them of lost KOMs, would like to see these marks stricken. We are talking about a convicted doper who now has admitted to selling EPO. We are talking about a strong but undistinguished big guy who was pack fodder in Pro/1/2 crits who has taken dozens of KOMs from far smaller WorldTour climbers. It’s a good story, from someone who knows how to tell it. Richard Masoner of Cyclelicious forwards word that the bike path through Camp Pendleton will be closed next week — as will the usual alternate route on the shoulders of I-5 through the base. The U.S. Marine Corps is planning to temporarily close the Camp Pendleton Bike Path—the only bike access between Las Pulgas Rd. and Basilone Rd. along Interstate 5 (I-5)— for military operations between this Monday, Mar. 28 and Friday, April 1, 2016. Under normal bike path closure circumstances Caltrans would open the freeway shoulders in this segment to bicyclists, however there is a construction project that has closed the shoulders of I-5 in that segment. Caltrans will provide a 24/7 on-call shuttle to carry bicyclists through the closures in the I-5 corridor between Oceanside and San Clemente. The phone number for the shuttle is (619)385-3267. Pick-up/drop-off locations are at Oceanside Harbor in the east parking lot (NW corner of the lot), at the park and ride lot at Las Pulgas Rd., and Basilone Rd. (at the south end of the Trestles bike path, where it meets Old Hwy 101). Signs at these locations will include the shuttle phone number. Please share this information and make your plans accordingly. We apologize for any inconveniences in advance. A British driver is caught on video deliberately driving onto a sidewalk to run down a bike rider, who then gets up and smashes the car’s rear window. Councilmember Jose Huizar announces a new plan called DTLA Forward to improve safety in the Downtown area, including parking-protected bike lanes on Spring and Main. Which just shows what can happen when a councilmember actually gives a damn about improving safety, rather than blocking needed improvements. Boyonabike gets excited about the new buffered bike lanes on North Halstead Street in Pasadena. Especially since he called for them in his very first blog post nearly four years ago. Stephen Frears, director of The Program, talks with Variety about Lance and doping. 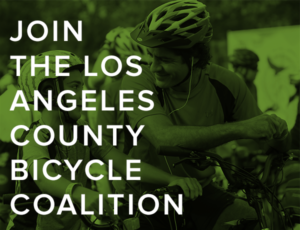 BikeSGV will celebrate the new Gold Line extension with a Bike the Gold Line ride this Sunday. 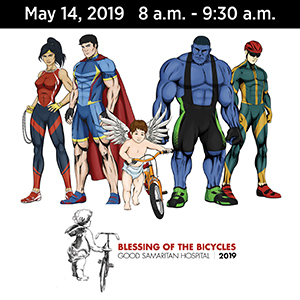 CiclaValley talks with John Morlock about Ride2Recovery and next month’s Honor Ride in Simi Valley. Redlands will host the 7th annual RUFF Ride this Saturday to benefit animals, including shelters, rescues and spay-neuter initiatives. Yesterday was National Puppy Day; celebrate by adopting an adult rescue dog who used to be one. San Francisco’s bikeshare system is expanding by adding 72 new stations and up to 1,000 more bikes by the end of the year. Bike-friendly UC Davis is looking for a new Bicycle Program Coordinator, while Calbike is looking for a Communications Director. I’ll take it if they change the title to Minister of Bicycle Propaganda. Portland traffic fatalities are running ahead of last year, despite the city’s Vision Zero pledge last year. Just adopting a Vision Zero isn’t enough; it takes real changes on the streets, as well as education and enforcement. And more than just one year. City Lab says every city needs a Bike Batman to recover stolen bikes, not just Seattle. 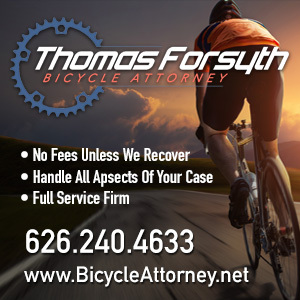 A Utah driver gets off with a misdemeanor after fatally running down a bike rider; he had a BAC nearly three times the legal limit following the crash. This kind of failure to take traffic crimes seriously is why people continue to die on our streets. Ohio transit workers pitch in to buy a 14-year old boy a new bike after his was crushed in a collision while on the front rack of a bus. Kentucky expands the time period for tracking DUI offenses from five to ten years; a fourth conviction for driving under the influence within a decade would be treated as a felony. Nice that they’re finally doing something. But allowing four strikes before the crime is taken seriously just keeps dangerous drivers on the road. A new Texas study says women who take oral birth control are less likely to suffer a knee injury and recover faster if they do. New York plans to remove a four-lane highway blocking access to the Niagara River, replacing it with a park and walking trails. A new study from the University of Duh says if you’re out of shape, an intense training session could do more harm than good. Which anyone who has gone for a hard ride too soon in the season can attest to. Your front derailleur could soon be a thing of the past. Argentina’s president gives President Obama a new 250-watt e-bike foldie (scroll down). Which should be good for zooming around DC once he’s a private citizen next year. A Toronto cyclist says a new parking protected bike lane could be a game changer. A Belgium bike race goes ahead despite this week’s terrorist attacks, with a local favorite coming in first. Bike Radar talks with the German expat bike shop owner at the heart of Dubai’s cycling revolution, who’s selling high-end bikes to royal customers. Surprisingly, an Australian study shows there’s no difference in how drivers treat cyclists, regardless of whether they ride themselves. That $3,000 Chinese smart bike has already smashed its crowdfunding goals, selling 110 bikes with two more weeks to go. Tokyo authorities hope a new bikeshare system and a 100-bike sidewalk parking space will reduce the number of illegally parked bikes in the Akihabara district. Yes, your bike helmet has an expiration date, or maybe not, after all; thanks to Ron Richings for the correction. What do a tandem bike, a WWII grenade and a headless Paddington Bear have in common? And a Kansas man noticed someone riding a bike that looked just like his son’s. Because it was. Enjoy your blog. Having cycled around LA (mostly Santa Monica and vicinity, plus downtown) and San Diego over the last few years it is interesting to see what is happening in your part of the world. Appreciate your summary of stuff from the wider world too. Keep up your good work! There are folks, including me, who really appreciate the work that you do. There are reasons to replace your helmet, but simple age is not one of them. Extensive testing of used (but not crashed) bicycle helmets shows that the foam liners retain their performance over many years. MEA Forensic announced at a May ASTM F08.53 technical meeting the results of their testing of 675 bicycle helmets, some as old as 26 years. “There is no justification for two to ten year replacement recommendations based on impact performance,” said MEA’s Alyssa DeMarco. MEA and collaborator Collision Analysis collected 1,500 used helmets from consumers and eliminated any that showed damage or did not have date of manufacture stickers. The helmets studied had dates that ranged from 1987 to 2013. They crash tested them at 3 m/s (a drop of 1.5 ft.) and 6.2 m/s (a drop of 2 meters–the CPSC standard drop) on a flat anvil in the dry ambient condition. There were only four that exceeded the 300g maximum threshold: three of the oldest models made to meet only the old ANSI standard, and one newer model that had been recalled. So 671 of the helmets passed the current CPSC impact performance standard. MEA’s analysis showed that there was no significant impact performance change with age. Their 26 year data including all 675 helmets tested produced only a 0.7g per year increase in impact readings at the higher drop height. On average, road helmet models produced results 40g lower than skate-style models, and extra-small helmets were 21g lower than large helmets. Lower g’s registered in the headform means less shock passed through to the head, but since they are averages they may not apply for a particular helmet model. After crash testing the helmets on a standard test rig, MEA took core samples from an uncrashed area of 63 of the helmets and tested them at the equivalent of a 6.2 m/s helmet impact. This generated data based solely on the foam performance. They collected stress and strain data related to aging of the foam. Again, the findings indicate that helmet liner foam does not deteriorate with age. MEA usually publishes their studies in a peer-reviewed journal, but that can be a slow process. This is the first time anyone has applied rigorous science to assessing the effects of age on helmet foam liners. It is a welcome antidote to the strident marketing claims that foam deteriorates with age. There are other reasons to replace a helmet–crash damage, strap deterioration, improving fit–but simple aging of the foam liner is not one of them. A Utah driver gets off with a misdemeanor after fatally running down a bike rider with a BAC nearly three times the legal limit. A Utah driver with a BAC nearly three times the legal limit gets off with a misdemeanor after fatally running down a bike rider. Otherwise, it reads as if the bike rider had a BAC nearly three times the legal limit. Good suggestion. I struggled with the wording on that one. Ha, Rich Richings beat me to it. Polystyrene never dies, though the bike helmet industry may like you to believe otherwise. I ask you, would car drivers tolerate the only safe route through an area getting closed with no alternative designated? There needs to be a real bike path through the area that does not require a security check from the US Govt. to use. And it needs to be open 24/7. This post reminded me that I applied 6 weeks ago for the security credentials to ride through pendleton using the bases online form. I have not heard anything from them? Has anyone here received a pass or anything to confirm registration to ride through the base?